Dog Rescue Newcastle rescues dogs from death row at local pounds and gives them a second chance. We don't have a kennel facility, all our dogs are in loving foster homes where they receive training and the best of care until we find permanent homes for them. 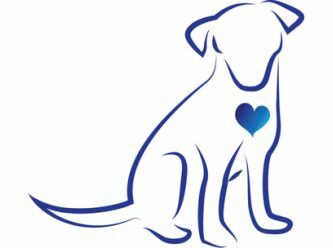 If you're interested in adopting one of our dogs, please contact the foster carer listed on the dog's profile (click on the dog's photo and scroll to the bottom of the description). All our dogs are desexed, flea treated, wormed, vaccinated, microchipped and Lifetime Registered. They all start out in their new homes on a two week trial period. 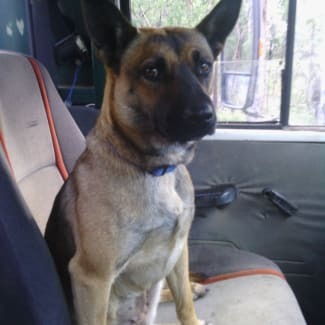 Most of our dogs are available to loving homes in NSW, ACT, QLD, VIC, TAS and SA but you must be willing to travel to the dog to meet him or her. Donations are tax deductible. Please help us by becoming a pet foster carer, a volunteer, or making a donation. We prefer payment by funds transfer and don't accept cash or personal cheques. 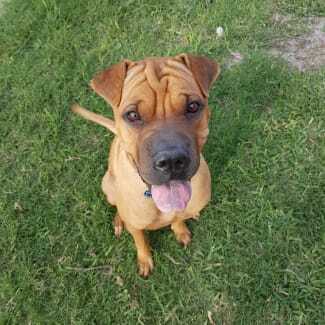 Cleo is a 1 year old Mastiff x Ridgeback girl with a huge heart and beautiful nature. Cleo loves to cuddle and show you how much she loves you, she still likes to sit on your lap when invited but shes realizing shes getting a little big for that and rest her head on your lap instead. 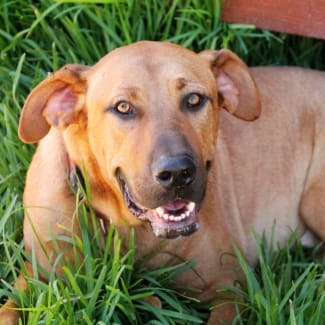 Cleo plays outside through the day with the other dogs who she loves and gets along with really well. She sleeps inside at night and is now toilet trained. Cleo's perfect home would be with another dog or as someone's companion going places with them etc. She doesn't like being home alone without either a person or another dog for company. Cleo isn’t suitable for a home with birds, cats or pocket pets but a doggy friend of her own size would be perfect. Cleo is learning basic commands and will be a perfect girl with continued training. She loves learning. 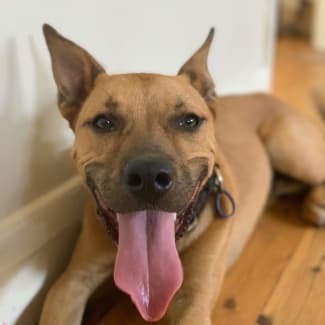 Cleo is good with kids but does jump up to play with little ones she will come away from them when called so supervision will be needed if kids are playing otherwise she loves to sit and snuggle with kids. Cleo loves to play tug o war, chasies, and jumping around in the shell pool on a warm day. She’s good walking on the lead and so far not afraid of storms or fireworks. 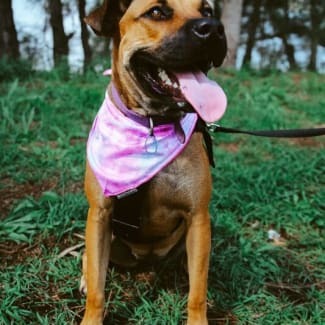 For more information or to meet Cleo, please contact her foster carer Joy on joy.was.here@hotmail.com Cleo is in foster care in Woodrising, NSW and is available for adoption interstate. Cleo’s adoption fee is $350 and she is desexed, vaccinated, treated for fleas and worms, microchipped, and lifetime registered.